An exhibit opening Friday, July 7th, at an Anchorage art gallery takes a look at a reality most of us hope to avoid — the world of combat medics. The photographs feature Alaska National Guard members jumping out of aircraft, training exercises for recovering casualties in combat zones, as well as for Search and Rescue missions state-side. Ahead of it’s opening, photographer Joe Yelverton is putting the finishing touches on the show, which is titled “Unseen.” On the white gallery walls are 33 large-format images of soldiers rigging parachutes, trudging along mountain tops, and leaping out of helicopters looking as calm as if they were ordering lunch. “They are strangely at ease in situations that would make an ordinary person just freak out,” Yelverton said. One of the most arresting images in the show draws its power from the grim duality of combat medicine: the violence of warfare, alongside the drive to keep people living. 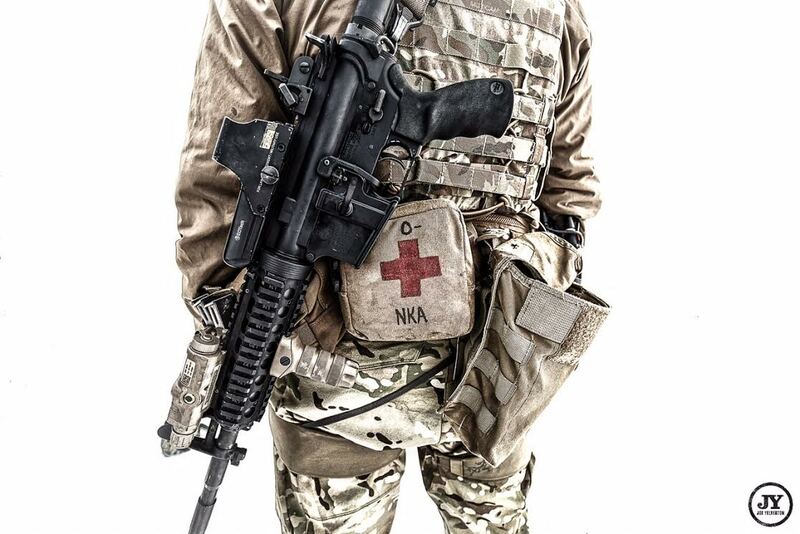 Against a white background is a soldier with his back-turned, a black assault rifle pressed against a bag marked with a red cross. “This is just a bag of blood on a waist-belt,” Yelverton said. Even on training exercises, the soldiers Yelverton photographs are prepared for morbid injuries and a rapid rescue response. These particular photos are from the last year, when Yelverton went out on more than 15 training missions with the guard members across different parts of Alaska. But the project really started more than three years ago, when Yelverton made friends with Roger Sparks, a para-rescueman with an accelerating career as a tattoo artist. The two were introduced at a potluck in Eagle, started hanging out, and Yelverton began quietly listening to more para-rescuers talk to one another about their experiences. “In the process of hearing many of their stories I became really curious about seeing them working,” Yelverton said. The show’s title, “Unseen,” is Yelverton’s attempt to highlight the invisibility of work he finds astounding. Many of the images convey his sense of awe, not just with the danger involved in routine training exercises, but also Yelverton’s own fascination with the understated attitude of the subjects themselves. The images never feel like advertisements, but they also lack critical distance. Yelverton’s project was to shine a light on para-rescuers not in order to expose a sinister secret, but instead to give people a clearer sense of the extraordinary work happening beyond public view. Particularly when it comes to search and rescues for civilians in Alaska, some of which end up saving lives. The “Unseen” exhibition is up at the International Gallery in downtown Anchorage through the end of July.